For a long time ago, I’m not writing any article about the server (nginx) optimization because my VPS that’s powered by Digital Ocean is working flawlessly on the lowest plan with just $5/month. Do you know? If you do over optimization on the lowest VPS hardware on Digital Ocean, it will decrease your server performance instead the good results which you’ve expected. Although it can’t improve by itself, you really want to make it… better by switch from php-fpm to hhvm. HHVM is an open-source virtual machine designed for executing programs written in Hack and PHP. HHVM uses a just-in-time (JIT) compilation approach to achieve superior performance while maintaining the development flexibility that PHP provides. Is that better than PHP-FPM? You can find a ton of comparison between HHVM and PHP-FPM by Google. I won’t go into details here but I show you a small result that I’ve tested with Apache Bench (ab). 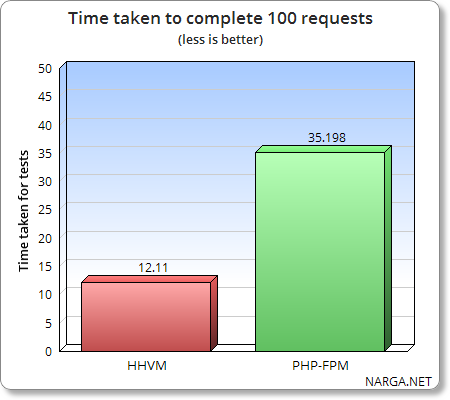 I’ll make 100 requests, one at a time, to the VPS running Nginx + PHP-FPM and Nginx + HHVM. I’m doing a concurrency of one, to test how fast each configs can handle the single requests. That’s 0.12 seconds per page request on HHVM. How to switch to HHVM from PHP-FPM? If you used FastCGI by default, you don’t need to change the configuration of your nginx, just stop php-fpm service then restart nginx to make it work. In absolute basic terms, this is saying, whenever the web server is asked to display a PHP file then this rule will take effect. Don’t forget to stop php-fpm service then restart nginx. That’s what. However, if this post doesn’t help you, maybe use the comments below to see if you can help others’ or other folk can help you? NARGA.NET is a website (blog) about web development, graphic and WordPress related. Do you interesting with our website to post your own post or place your advertise? Contact us now! This fascinating. I’m looking forward to implementing this is my own machines. Sloppy response times are frustrating me on some instances. Thanks love your work.! Your stats look very promising – thank you for sharing. Does this also work with forced site-wide SSL ? This site is licensed under Attribution-NonCommercial-ShareAlike 3.0 license. Feel free to change, reuse modify and extend it. Some authors will retain their copyright on certain articles. NARGA.NET utilizes affiliate links and may receive a comission if you click an affiliate link and make a purchase.